TRNSMT is Scotland's newest festival and will take place at Glasgow Green this summer. 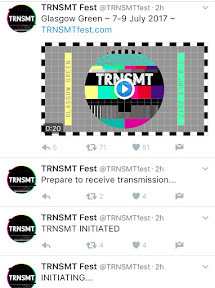 Festival bosses DF concerts revealed the name today in a short video which features lot of bleeps and electronics noise behind a graphic that was reminiscent of an old TV holding page. The dates Glasgow Green 7-9 July were placed underneath the video with a link to a website that asks you to register for more info. The only other info available at this stage is who the sponsors are - BBC Scotland, Big Green Couch and Utilita. Festival fans are currently speculating about the fest, which is expected to be a non camping affair. Rumours have already circulated that Coldplay and Radiohead may be playing the fest but more news will be revealed in coming days. Music fans are clamouring for more info with one saying: "Buzzing to see the line up." Another added: "So it's it dance orientated or mixed music? Anyone know yet?" FANCY A PIECE OF HEAVENLY TRAINSPOTTING CAKE?